Crimean prosecutor, Natalya Poklonskaya, an internet sensation, whose anime-style images gained her overwhelming popularity, particularly in Japan, has found herself among forty officials put on a sanctions list by Tokyo. "Japan will continue our coordination with G7 nations and the international community to achieve a peaceful and diplomatic resolution of the Ukraine situation," Chief Cabinet Secretary Yoshihide Suga told a regular briefing, according to AFP. "We have made our decisions to select those who were directly responsible for the annexation of Crimea and destabilization of eastern Ukraine, and after we reviewed sanctions by the United States and EU." Adoration by the Japanese online community did not save the Crimean prosecutor, Natalya Poklonskaya, from being added to Tokyo’s black list. Poklonskaya took up her post just days ahead of the March 16 Crimean referendum on independence from Ukraine, after four of her male colleagues refused to take the risk. Her first press conference gained her YouTube stardom, garnering 3.7 million views in just three days. 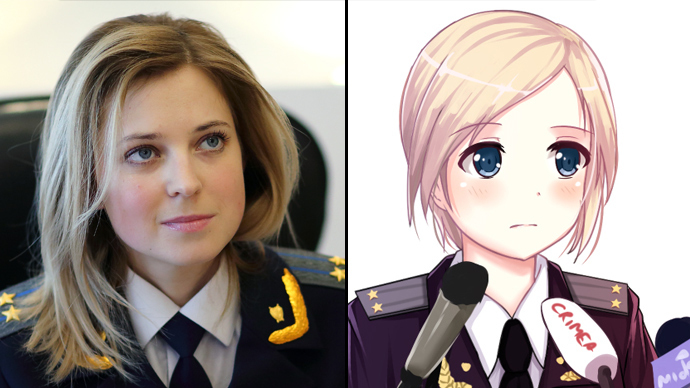 Her youth, good looks, quiet voice and emphatic statements inspired a lot of anime-style images of Poklonskaya, and earned her the nickname of ‘Prosecutie’. 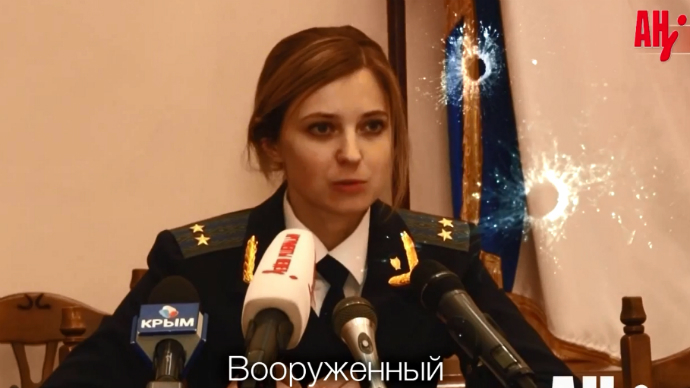 In Russia she received an online nickname “nyasha” (sweetie), to which Poklonskaya reacted by saying she would prefer to be perceived as a prosecutor and will not tolerate any meaningless “nyash” or “myash” while at her post. That secured ‘Nyash-Myash’ as a popular nickname for the young prosecutor. She has not yet reacted to being included on Japan’s list of sanctioned officials. The response to Tokyo’s sanctions has mainly come from the Russian Foreign Ministry. Moscow now believes it “inappropriate” to hold diplomatic consultations between deputy head of the Foreign Ministry, Igor Morgulov, with his Japanese counterpart, Shinsuke Sugiyama, scheduled for the end of August. “Now that Tokyo has adopted additional anti-Russian sanctions, we consider it inappropriate to hold this meeting. Consultations have been postponed,” deputy head of the ministry’s information department, Maria Zakharova, told journalists. Apart from individuals, two Crimea-based companies have also fallen under Japanese sanctions – energy company Chernomorneftegaz and oil base Feodosia. Tokyo has also banned all imports from Crimea. Japan has announced sanctions against Russia before. In April, it said it would not issue visas for 23 Russian officials. Switzerland also expanded its sanctions against Russia on Tuesday. It announced the addition of 26 individuals and 18 companies to its sanctions list. This comes despite comments over the weekend from Switzerland's Economy Minister, Johann Schneider-Ammann, who said his country wouldn't duplicate EU sanctions against Russia.